The most important part of your house is its foundation. If it hasn’t been built properly, the entire structure will weaken over time. Settlement, weather conditions, soil problems and moisture can also cause foundation damage and escalating problems such as wall cracks, sloping floors and bowing walls. If you have foundation issues, hiring a skilled and experienced foundation repair expert is critical. Also make sure your contractor is licensed, insured and bonded. California’s Contractors State Licensing Board (CSLB) is part of the California Department of Consumer Affairs. The purpose of the CSLB is to license and regulate the State’s construction industry. This includes ensuring that construction is performed in a safe, competent and professional manner, and the contractor adheres to applicable laws, regulations and standards. The State of California also requires contractors to have a bond. A Contractor’s Bond provides homeowners with financial protection for home improvement projects. Once you verify that a potential contractor is licensed and bonded, find out how long he or she has been repairing foundations in your area. A local contractor will have in-depth knowledge of your city’s building codes and familiarity with construction methods in your area, as well as familiarity with regional weather and soil conditions that can harm your foundation. Experience is another vital factor when choosing a foundation contractor. There can be many ways to repair a foundation. Some jobs can be done in a minimal amount of time, while others will require significant work. An experienced contractor will be able to find the source of the problem and recommend cost-effective solutions that will fix the issue avoiding excessive foundation repair cost. You should also be given a detailed proposal with the type of work that will be needed, with accurate pricing and no hidden fees, so you will know how much does foundation repair cost before work begins. Finally, ask for references and call the names you are given to find out if the customer was happy with the work that was done. Julian De La Torre, expert in Los Angeles foundation inspection, repair & house leveling (Los Angeles) and founder of Julian Construction (www.julianconstruction.com) in Los Angeles, has inspected over 15,000 structures, working with engineering firms & local departments of building & safety. 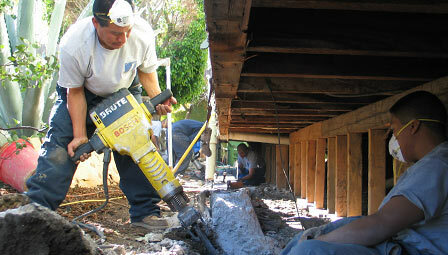 The company has done more home foundation repair (Los Angeles) than any other company in the area over the last five years (julianconstruction.com/services). Julian Construction owns its own company and is a “no middlemen” model–no salesmen or subcontractors–you get the principals of the company & its workers under your home.